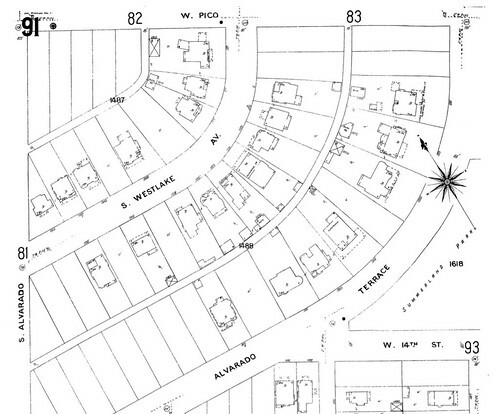 Back in July 1904 the Los Angeles Times reported the Alvarado Terrace Company had bought the handful of acres between Pico and 14th and Iowa and Alvarado Terrace for $7,000. The paper went on to say, “a portion of the strip is already set out in grass, and the Alvarado Terrace people are to put a $500 fountain on the property. 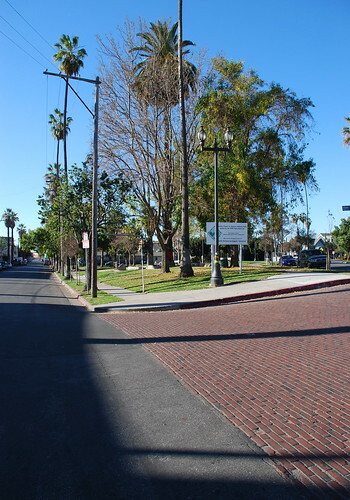 The land will make a very pretty little park.” Officials broke ground on what was then called the Alvarado Terrace Park at the end of the month. Soak in this morsel of a Sanborn fire insurance map from 1900. 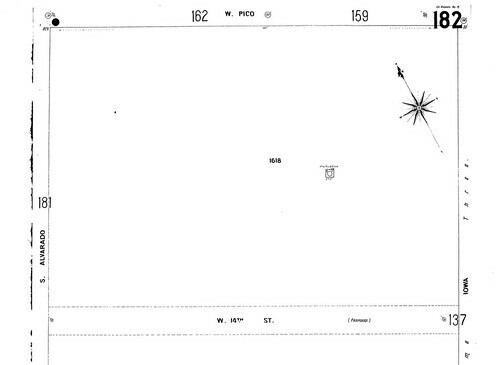 (Sanborn’s surveyors must’ve loved coming upon barren blocks like this.) Just a few years later it would bear Terrace Park and Powers Place. Remember Iowa Street? I sure don’t. 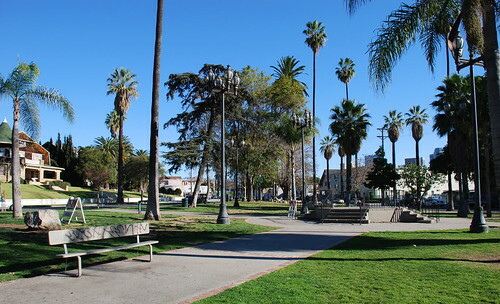 For a bit of backstory, at this time the city councilman for the Fourth Ward, in which the park was located, was a man by the name of Theodore Summerland. In early 1903 he ran his campaign promising he’d bring his constituents two things: a street railway line on West 11th Street and a park. He delivered of both of these promises, earning a bucket of good will. So much so, from the very announcement of the city’s buying a chunk of Fourth Ward land for a park, it was assumed it’d take the name of the popular councilman. 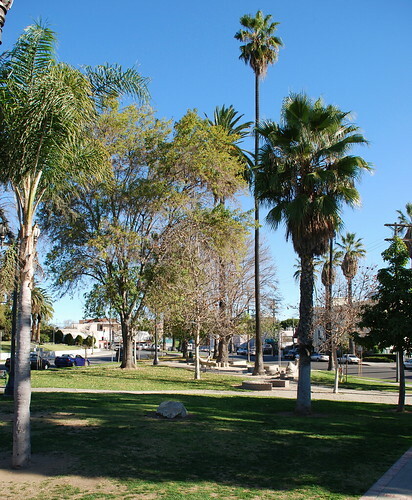 However, in August, the city went ahead and named the new park Terrace Park. Upon hearing what council had done, the Park Commission, on August 25th, raised its hackles. The commission rescinded the City Council’s action, saying naming parks was its territory, not the council’s. 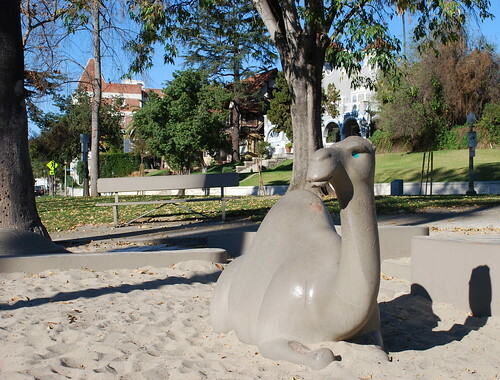 The Park Commission thereby christened the park after our old friend, Mr Summerland. The City Council balked and repealed its ordinance. But get this. 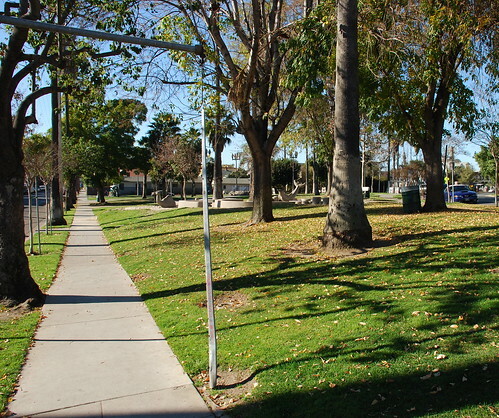 By early September, with his political enemies’ scorn making waves, councilman Summerland was modestly filing a statement with the city clerk asking the name revert to Terrace Park, claiming he was in San Diego when it was decided the park would take his name. The city council, though, ignored Summerland’s request! 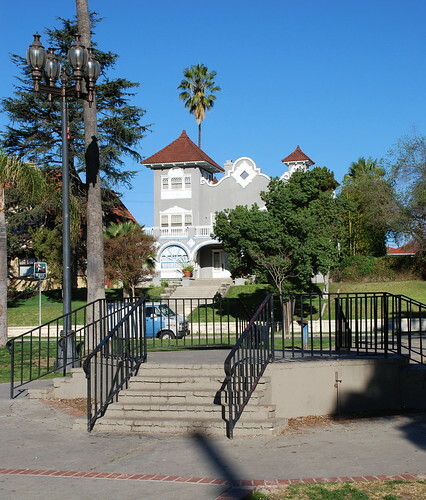 On Halloween 1904, ultimately, the name was switched from Summerland Park back to Terrace Park. From a 1906 Sanborn map. 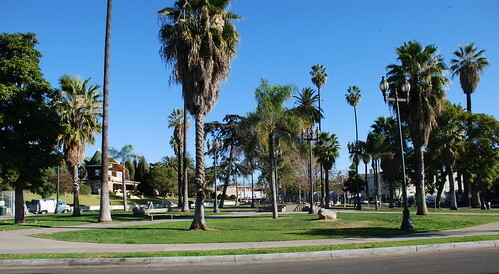 Even though the name had changed two years earlier, the park here still bears the name Summerland. You know what’s cool? The park had at one time an underground storage shed where the full-time gardener kept his tools. I wonder where that was (and if the remains of said gardener have decomposed within). 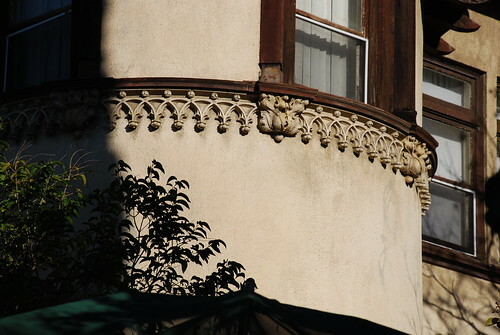 An extensive remodeling in 1921 was followed by smaller scale revisions throughout the years. I like this park real well. A tiny oasis, it benefits by the seven HCMs on its westside, of course. 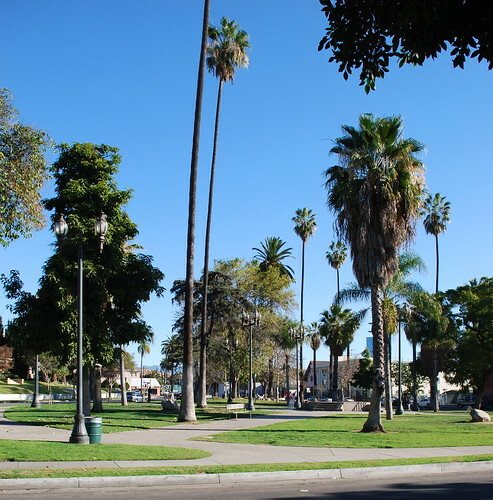 If it were up to me (and it’s not), I’d scatter smaller neighborhood parks of this sort across the city of Los Angeles rather than lay out grandiose projects like the city’s State Historic Park currently in the works. But, again, it’s not up to me. 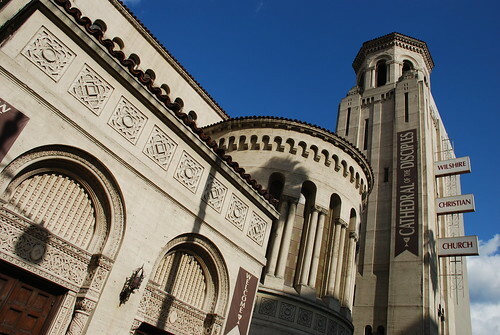 Los Angeles Historic-Cultural Monument No. 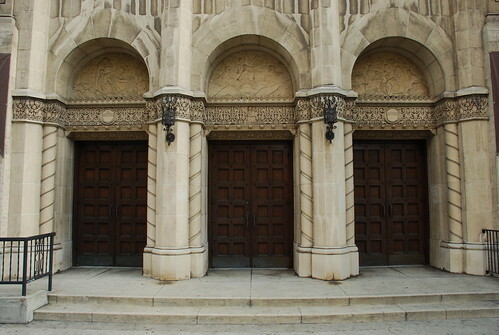 209, the Wilshire Christian Church Building, originates from the late 1920s, but the roots of the church itself stretch back 135 years. 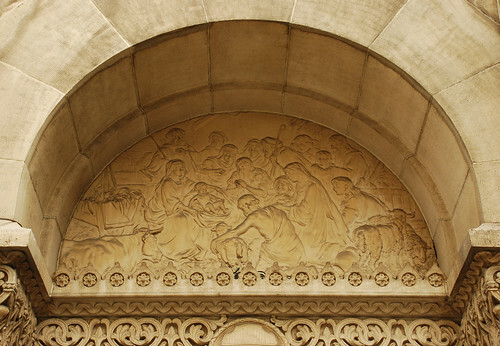 Christian Church (Disciples of Christ) held its first service on August 9, 1874, in the city’s Court House. The church was chartered a few months later, at the end of February 1875. 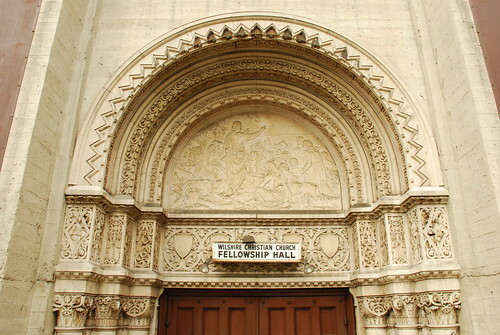 In December 1881, the organization set up its first chapel on Temple Street property donated by dry goodsman Rev. B.F. Coulter between North Fort (Broadway) and Buena Vista. 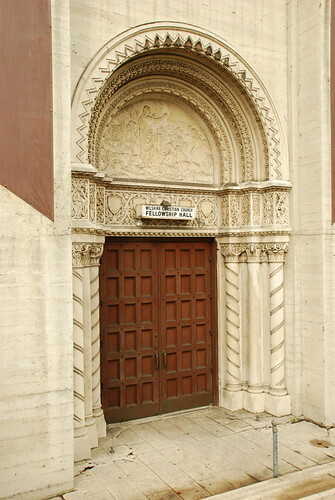 The Temple Street Christian Church became the First Christian Church of Los Angeles when it relocated to 11th and Hope Streets in July 1894 (this church building was razed in 1961). 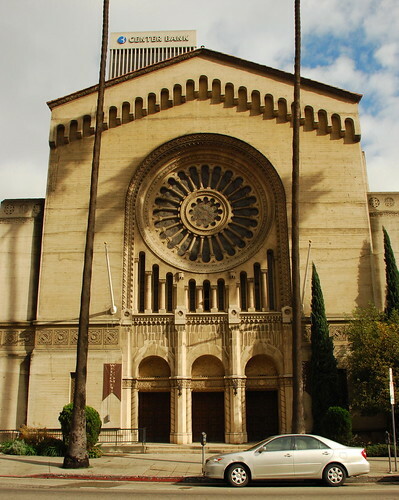 The congregation consisted of 1,200 members at this time, the largest church in the west. Jump forward a decade to 1904, when Magnolia Avenue Christian Church was founded as a mission church at 25th and Magnolia. 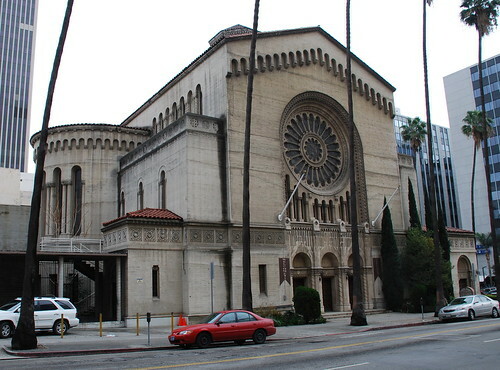 Architect Robert H. Orr had already designed a few Los Angeles-area churches – including the First Baptist Church in Sawtelle, the Hollywood Christian Church, and the Japanese Christian Church – by the time of the September 6, 1925, groundbreaking of Wilshire Boulevard Christian’s new Romanesque Revival home. When first announced, it was figured the building would run $400,000. 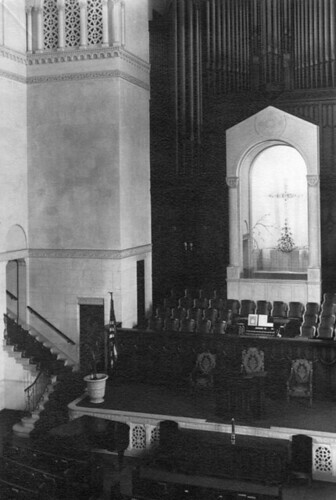 This was at the start of spring 1924 when plans called for an “English Gothic” building comprising two units – the auditorium, with 1,500 seats, and Sunday school. Also to be included were and social hall and banquet room, a stage, gymnasium, lecture room, classrooms, and general offices. By February 1925, the cost was now estimated at half a million. The Wurster Construction Company received the building contract later that August. Dr M. Howard Fagan, pastor since 1919 when the congregation was made of less than 300 members, along with Dr J.H. Garrison, turned the first shovelful of earth at the 9/25 groundbreaking. 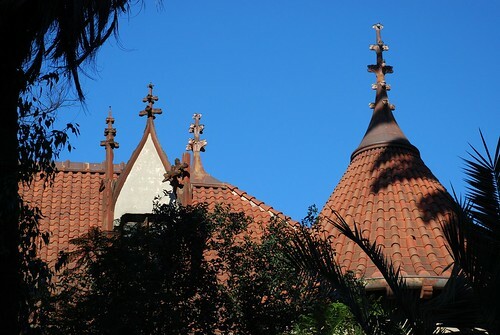 By the building’s dedication on April 3, 1927, its cost was pegged at $407,000. Dr Charles S. Medbury, pastor of the University Christian Church and “the most useful citizen of Des Moines” according to a newspaper contest, gave the dedicatory sermon. Also part of the ceremony, Miss Julie Keller led an ensemble of seven harps and a violin. Mr and Mrs Lewis E. Grigsby presented a set of twenty-one chimes, installed at a cost of $14,000. Dedicatory meetings were held every evening for the following two weeks. Here’s a shot of the monument’s Rose Stained-Glass Window, the recipient of the afternoon sun, by our friends at Judson Studios. 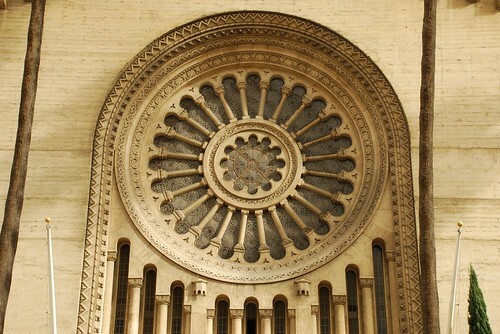 Why didn’t they orient the building so this would face Wilshire, I wonder? 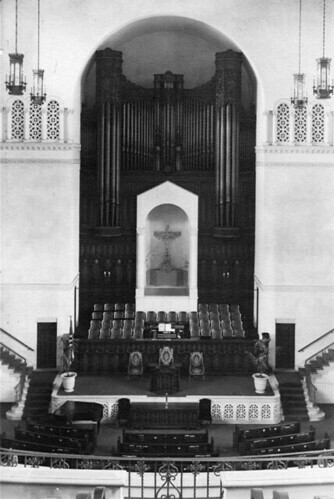 Orr’s three-story, reinforced concrete church building featured a seventy-five foot tall ceiling (still does, I guess), oak woodwork, and a floor covered with a “heavily padded Wilton carpet”. The organ case surrounding the bapistry had been ornamented with hand-carved panels. Today, the Sanctuary seats 950, and the smaller Mosely Chapel holds 110. The building’s Fellowship Hall contains a stage, dance floor, and gourmet kitchen. This last hall seats 350. 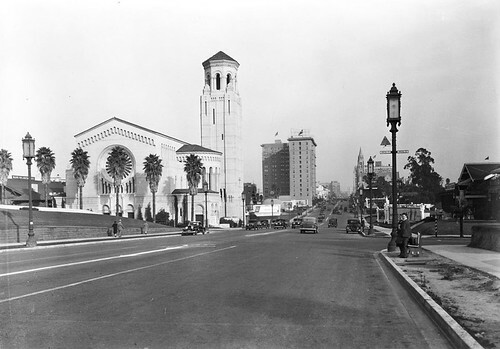 In 1935, the Wilshire Boulevard Christian Church merged with the Magnolia Avenue Christian Church. 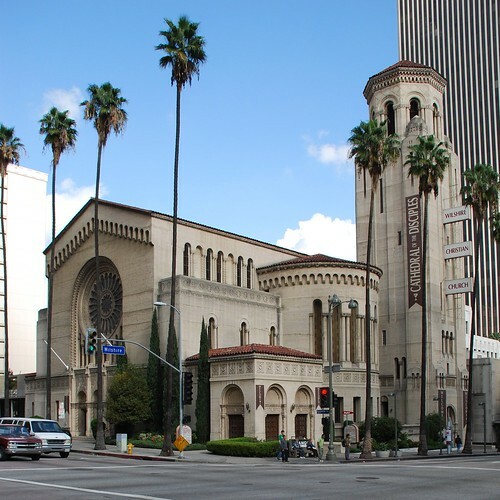 On May 19, 1940, the First Christian Church of Los Angeles then combined with Wilshire Boulevard Christian Church becoming, on May 23, 1945, the Wilshire Christian Church we know it today, still serving members of the Disciples of Christ congregation. 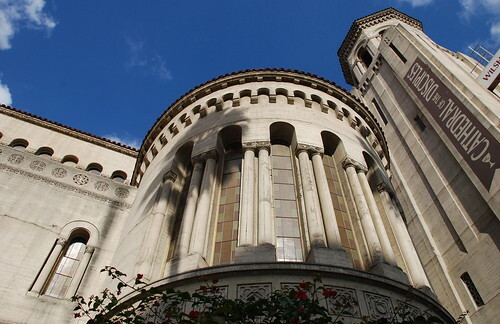 So, to re-cap: First Christian Church of Los Angeles (formerly Temple Street Christian Church and, before that, Christian Church) + Magnolia Avenue Christian Church + Wilshire Boulevard Christian Church = Wilshire Christian Church. 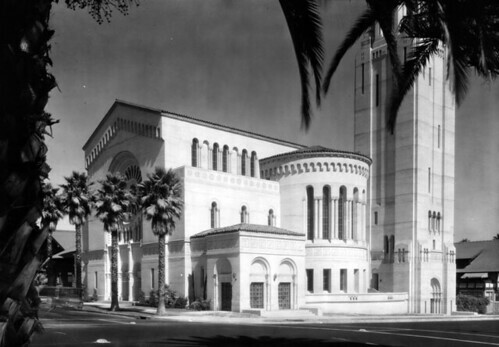 The Wilshire Christian Church Education Building replaced the 1911 bungalow in January 1959. 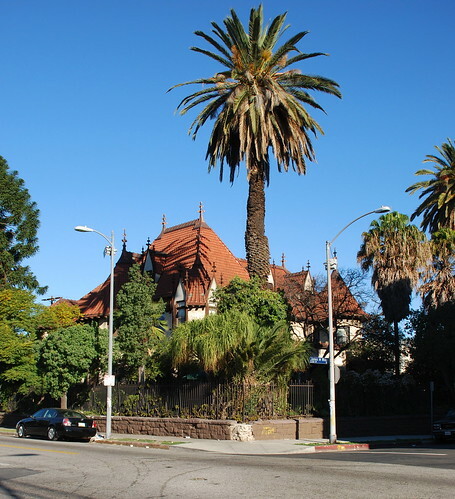 The Wilshire Christian Manor retirement home next door was built in 1969. 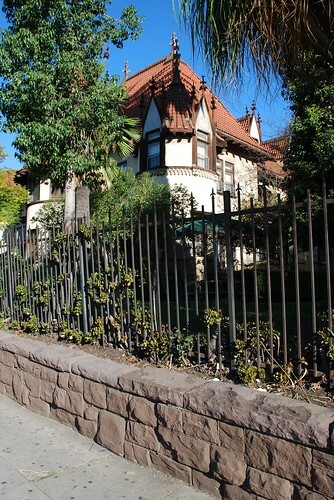 Today Los Angeles Historic-Cultural Monument is the Casa Libre/Freedom House, “an emergency and long-term shelter for minors without homes, including unaccompanied immigrant and refugee children.” The Center for Human Rights and Constitutional Law, Inc., bought the landmark in 1996, opening a shelter there for homeless children in 2002. 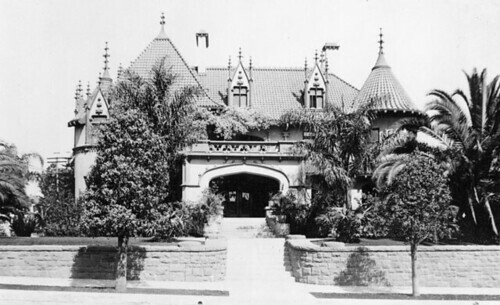 John Parkinson designed this two-story, thirty-five-room mansion for Mrs Susana Merchao de Bernard in 1901. Susana was born February 8, 1839 in Los Angeles. 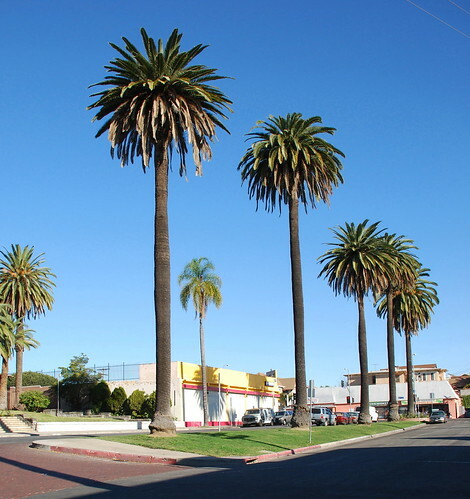 Her dad, Augustin Machado, and his brother, Ygnacio, along with the brothers Talamentes laid claim in 1820-1821 to the 14,000-acre Spanish land grant Rancho La Ballona, now Marina del Rey, Playa del Rey, and parts of Culver City. Now, going back even further, Augustin’s pop was Jose Manuel Machado. 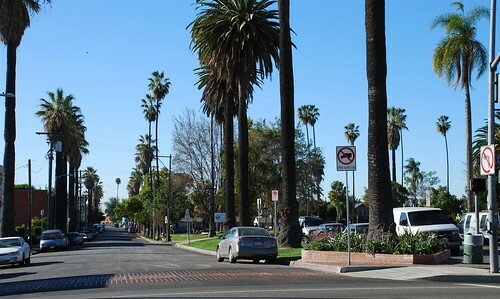 Jose came to Southern California in 1781, and, following Governor Felip de Neve, was one of the forty-four pobladores who hoofed it from the San Gabriel Mission on September 4, 1781, to found Our Fair City, El Pueblo de la Reina de los Ángeles. Good bragging rights for Susana, like if your great(x18)-granddad came over on the Mayflower. Susana Merchado married rich Swiss-French businessman Jean Bernard on November 27, 1865. Bernard died in 1889 at the age of 64, leaving Susana and eleven children (not all of whom were his widow’s). 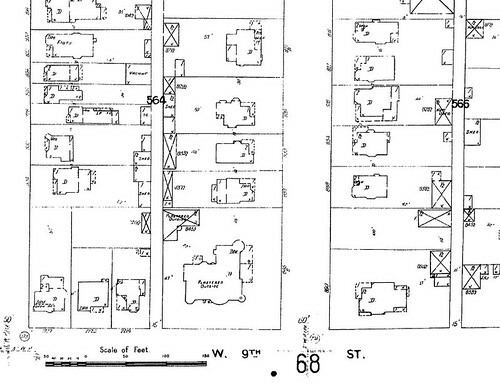 From a 1906 Sanborn fire insurance map. Bernard Residence at bottom, center. 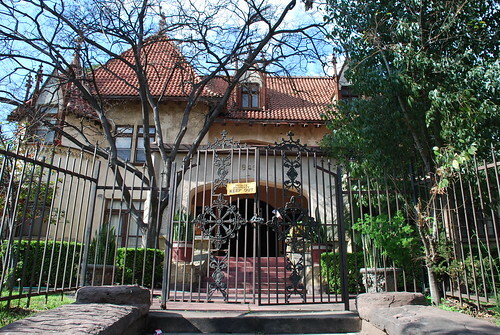 Parkinson created this 10,000 square-foot mansion – along with its carriage house – with elements of Gothic, Art-Nouveau, and Moorish styles, situated on Ninth Street fronting South Lake Street. The house cost the widow Bernard $50,000. 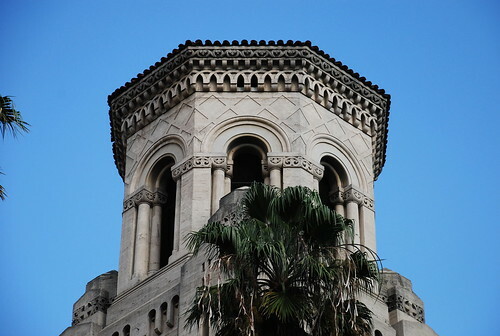 (Don’t forget: John Parkinson, alone and with partners, is all over the list of the city’s Historic-Cultural Monuments like white is all over rice – Union Station, the L.A. Athletic Club, Bullock’s Wilshire, and City Hall to name but four.) 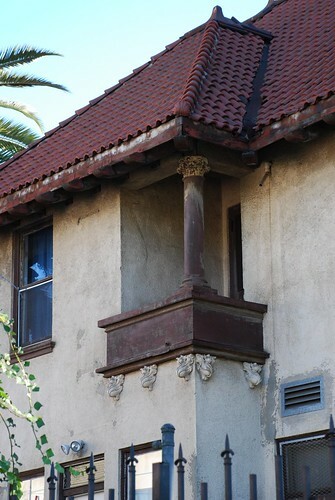 The contractor on the Bernard residence was John Rebman. 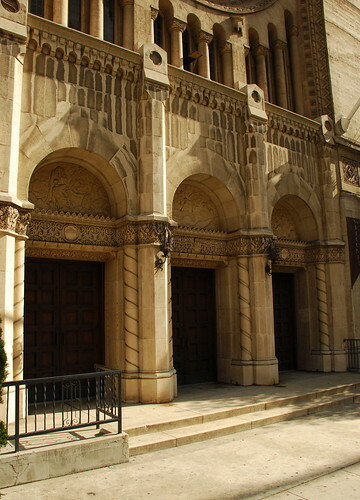 “The entrance is across a spacious recessed porch, and through massive doors into a reception hall, 20x20 feet. On the first floor is a library, 22x22 feet; a drawing room 19x24 feet; a sitting-room, den, two dining-rooms, the principal one of which is oval and 18x27 feet, and a kitchen and refrigerator room. On the second floor are ten bedchambers arranged both singly and en suite, with staeionary [sic] marble-top washstands and similar conveniences for each; and two bathrooms. The attic contains rooms for servants. 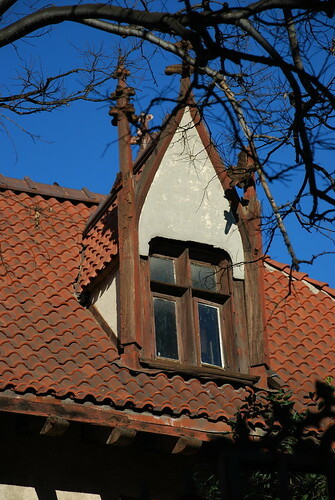 Susan Machado de Bernard passed away on April 8, 1907, but the home stayed in the Bernard family until 1962. 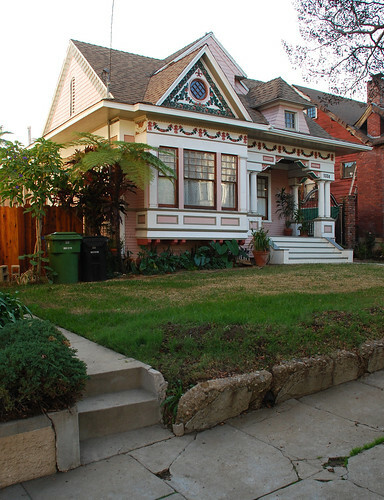 Subsequent owners included Leslie Grant and Jim and Gloria Gindraux, the couple who had the house designated a city landmark thirty years ago this month. 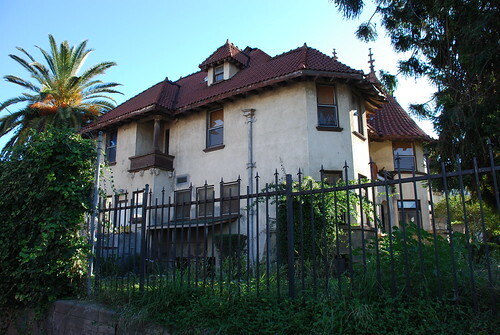 As the Susana Machado Bernard House and Barn, the site was added to both the list of California’s Landmarks and the National Register of Historic Places in 1979. Okay. 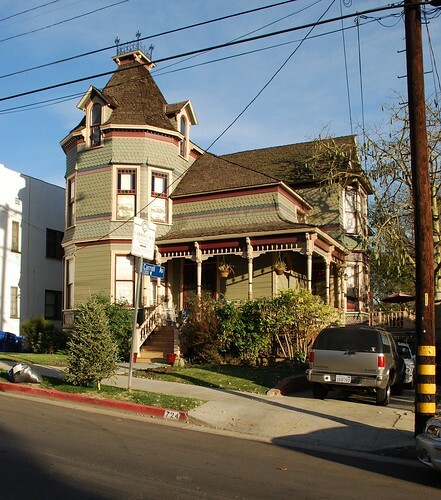 So we’ve visited all but one of Carroll Avenue’s Historic-Cultural Monument homes in Angeleno Heights (as I’m writing this, there’s one more to go, at No. 399). Now it’s time to go one street north to Kellam Avenue. 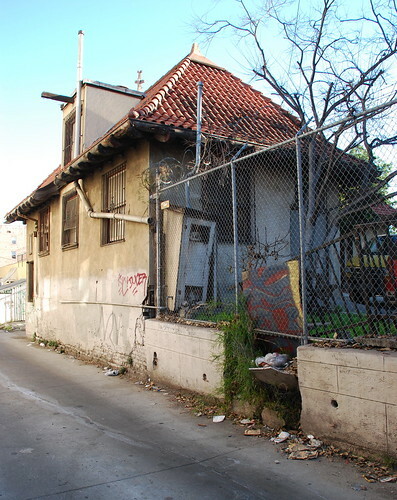 The homes here are much more hit and miss; some buildings are in poorer shape, either in disrepair or “renovated” feloniously. 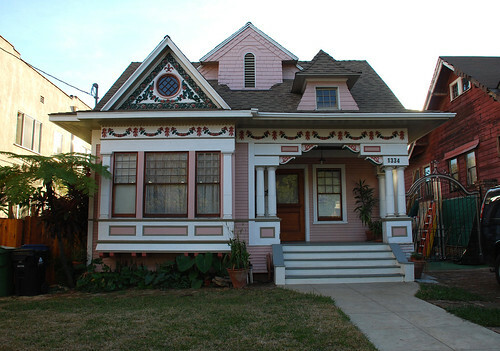 However, there are some real gems to be found on Kellam – like this one, built around 1899 for painter John Fonnell. That Fonnell was from Germany and his bride from Sweden would make a lot sense, looking at the landmark today. 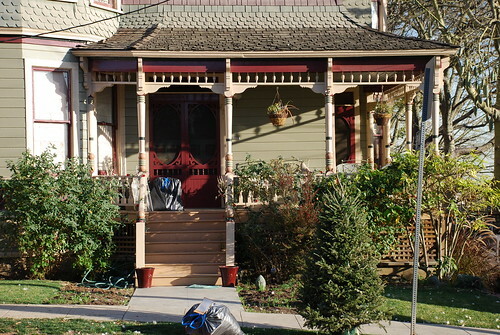 I know the guidebooks and such say this is late Queen Anne architecture with Colonial Revival elements (i.e. 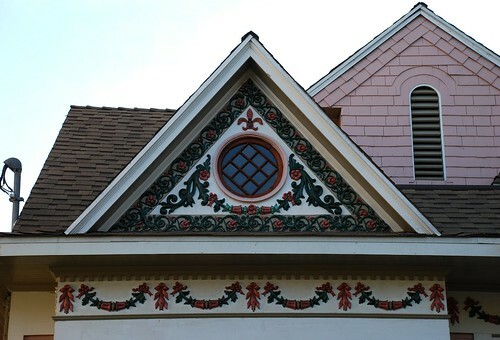 the six-columned porch), but the cottage, with its flower and garland over the bay view window, wouldn’t be too out of place in small, German village, no? 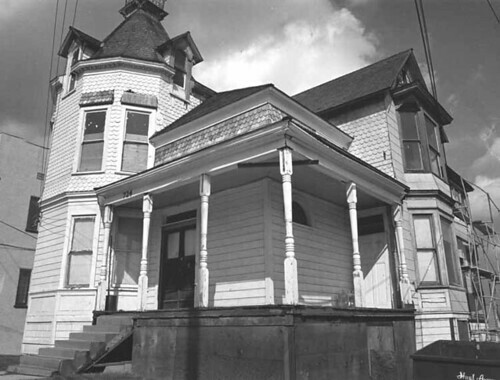 Louis Jacobson, his wife, Minnie, and daughter, Jeanette, from Massachusetts moved into 1334 Kellam in 1915. Jeanette died in 1974 at age 87. 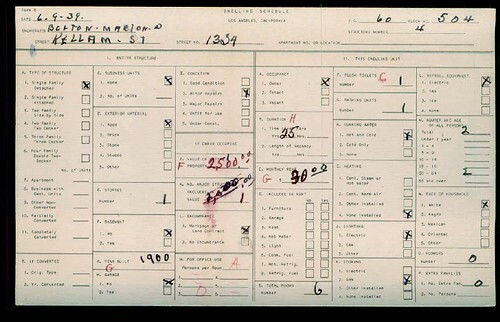 The 1939 household census below, from USC’s Digital Archive shows two people living in the six-room cottage. 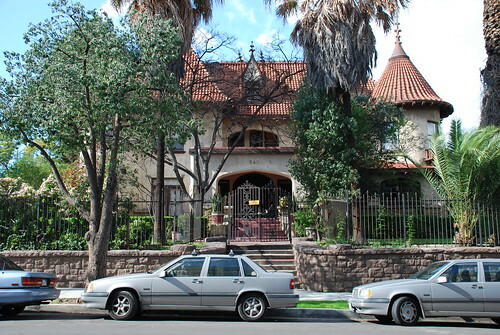 Nino and Amelia Guerrero bought the home in 1976. If you’ve heard of Nino, it’s probably as “the Latin Magician”. He won the 1969 Grand Prix of Magic. One of the coolest things (to me, at least) about HCM No. 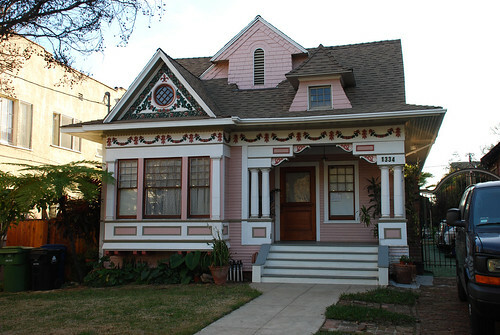 207 is it wasn’t the Guerreros who petitioned the city for the home’s landmark status, it was of neighbor of theirs – artist/author Leo Politi. 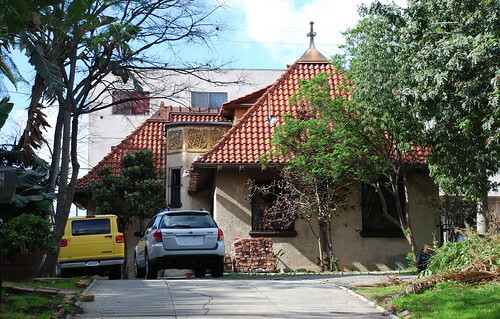 He was one of the Heights’ (and L.A.’s) biggest boosters, living just a few doors away at 945 East Edgeware (HCM No. 218). Everything I hear about Politi just makes me like him that much more. Thanks to local historian Tom Morales for his research providing a chunk of the information in this post. 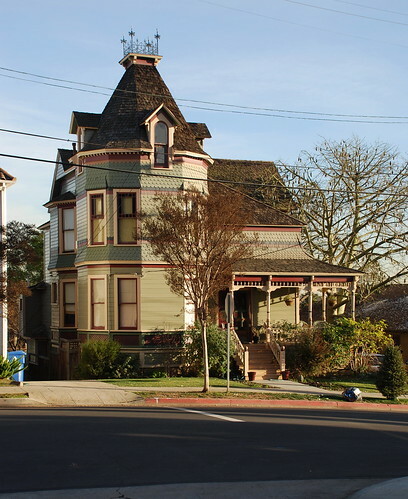 The mansard tower is such a distinguishing feature of this 1887 Queen Anne home, the landmark is sometimes referred to as the “Tower House”. The moniker Libby House, though, namechecks its first owner, Caleb Libby. Libby moved from Scarborough, ME, to Brooklyn, IA, at the end of the Civil War. In Brooklyn he was the president of the local school board. (How large a school system could Brooklyn, IA, have had in the late 1860s?) By the mid-80s, Libby had relocated with his family to Los Angeles where he was doing just great in the grain business. 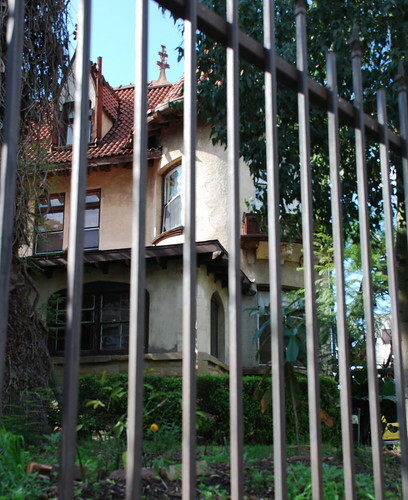 Nevada speculator Robert T. Briggs sold Libby three lots of Angeleno Heights land for $1,500. 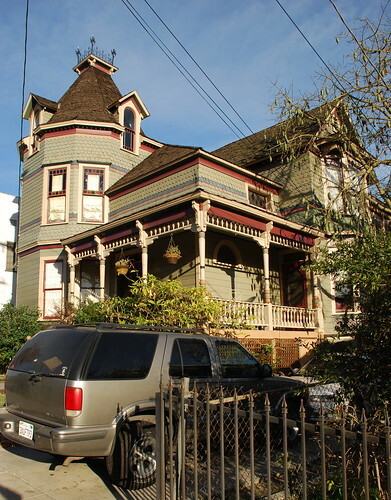 In 1887, Libby, by now dealing in real estate himself, built this three-story house (maybe from a plan book, maybe designed by architect Cecil Dover, or maybe in some third way). Libby also constructed a large carriage house. By 1916 Betina had inherited the house and, as is so often the case with spinster sisters, began to take in boarders. One of these men, as is so often the case with boarders, became romantically involved with his landlady, and he eventually inherited the house. 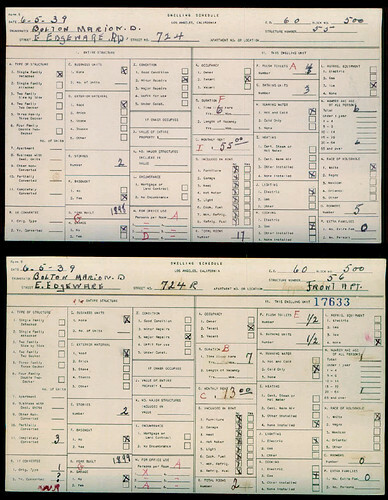 Here, from the USC Digital Archive, is a pair of 1939 household census reports for 724, both for the house and what I’m assuming was the carriage house, converted for apartments. I don’t understand why the house is checked as a ‘single family detached’ yet is home to six ‘roomers’. And the ‘year built’ is off by more than a decade. More intrigue. You know who lived here from 1954 to 1958? Anna Louise Strong, that’s who. Strong was a journalist, scholar, activist, and avowed communist (I didn’t know who she was, either). I have no idea if this was her last U.S. residence before she expatriated to China. She died there in 1970. Yet more mystery. 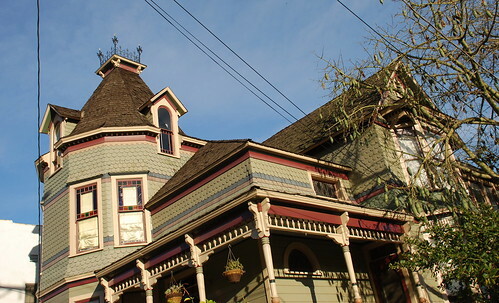 Tom and Peggy Levine were the owners of the Libby House at the time of its HCM designation just more than thirty years ago. Thanks to the CA State Library, here’s a photo by William Reagh taken around 1982. Compare and contrast with the shot beneath it. 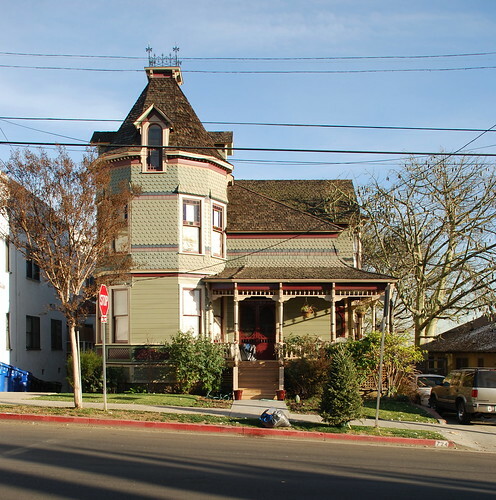 Much of the information I wrote here is from an article written by local historian Thomas Morales – who lives in the Phillips House across the street and wrote the history portion of 2004’s “Angelino Heights Preservation Plan” – in an article for the Parkside Journal. “Residents’ Commitments Today to Determine the Future” appeared on August 15, 1979.